Exciting positions available within the Aquatic Ecosystem Research Programme ! 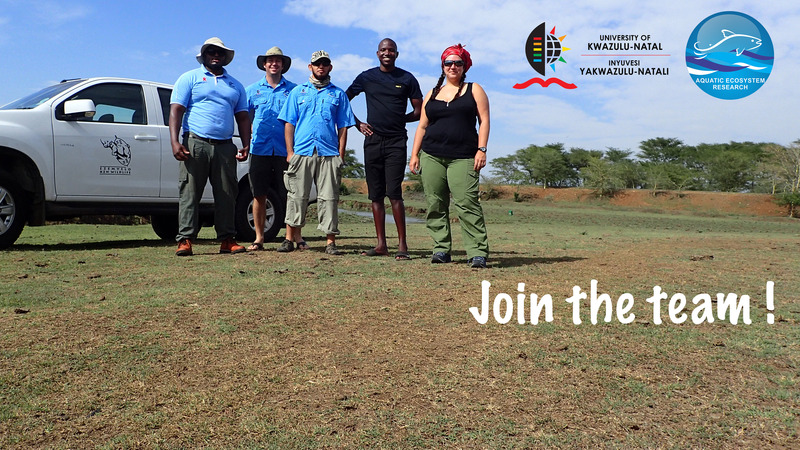 Three exciting MSc (possibly Ph.D) positions are available within the Aquatic Ecosystem Research Programme (AER) of the University of KwaZulu-Natal in Pietermaritzburg. The candidates will be integrated in a larger group of postgraduate students working in aquatic ecology within the AER. As part of an applied ecology group, the candidates will be expected to participate on other projects within the group. Project 1 (MSc/PhD): Behavioural ecology research on the KwaZulu-Natal Yellowfish (Labeobarbus natalensis) in the Umgeni River. Behavioural studies using fish movement and activity as variables are widely used to monitor ecological consequences of change in aquatic ecosystems. Techniques involving radio-telemetry in particular have been used locally and internationally to characterise the biology and ecology of fish including habitat requirements, and response to adverse ecosystem conditions, using a relatively small number of individuals. This study has been designed to implement the FISHTRAC real time fish and water quality and quantity monitoring methods established for South African, in the Umgeni River to monitor the response of yellowfish to changes in water quality and flows over a two year period. Project 2 (MSc/PhD): Fish as ecological indicators of ecosystem wellbeing in KwaZulu-Natal. For the past three years the AER has been monitoring the wellbeing of fish communities in rivers across KwaZulu-Natal. The aim of this study is to expand on existing fish community wellbeing data and evaluate the wellbeing of communities using multiple lines of evidence. In addition this study will compare and evaluate these lines of evidence. This two year study includes fish community structure sampling in rivers and lakes throughout KZN. Project 3 (M.Sc): Research on the diversity and population wellbeing of the Chubby head minnows of KwaZulu-Natal. Historical data suggests that the Chubby head minnow group of KwaZulu-Natal (Enteromius anoplus and E. gurneyi) may be a complex of species which is important for the conservation our biodiversity in the province. Many populations of these minnows are threatened and potentially in need of conservation which includes possible changes in the conservation status of populations/species. The scope includes sampling of fishes throughout KwaZulu-Natal. The collection of samples/data for genetic and morphometric analyses and a rapid risk assessment of threats to wellbeing of these fishes. Sc., Hons. degree in ichthyology, aquatic ecology, environmental sciences, zoology or similar (M.Sc for Ph.D candidates). Willingness to conduct field work and participate on surveys with other Post-graduate students within the AER. Drivers licence (experience driving 4x4s and towing trailers/boats would be an advantage). Enthusiastic, punctual, hard-working and pro-active.